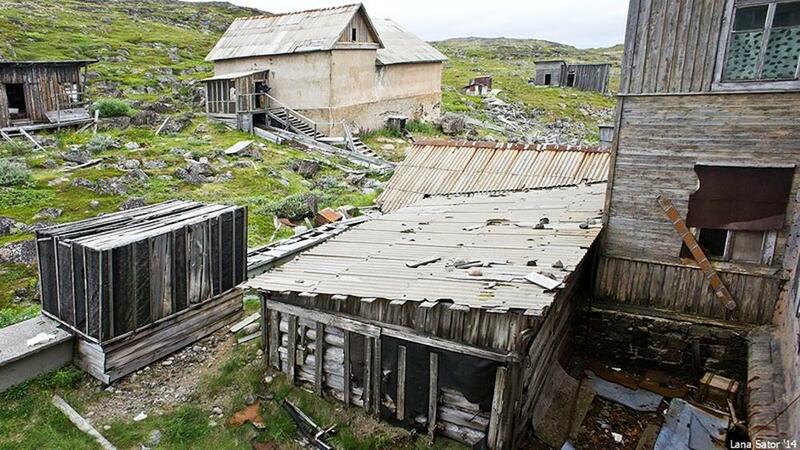 I suggest we take a look at what is left of the building of the seasonal Murmansk Marine Biology biological research base that was once its main building. The structure is made of wood, has three floors, a basement, an attic and a small brick tower. It is possible to move between floors by using one of the two staircases. The interiors are in a pitiful condition, which is not a surprise because the building has been abandoned since the early 1990s. Quite often you can come across vials with samples taken from the Barents Sea. The important and thorough research that was once carried out here had turned into piles of papers, multiple jars with chemicals, and a large collection of sea specimen, such as plankton etc. There are also some items left of the Soviet period. And some very old electrical equipment as well. 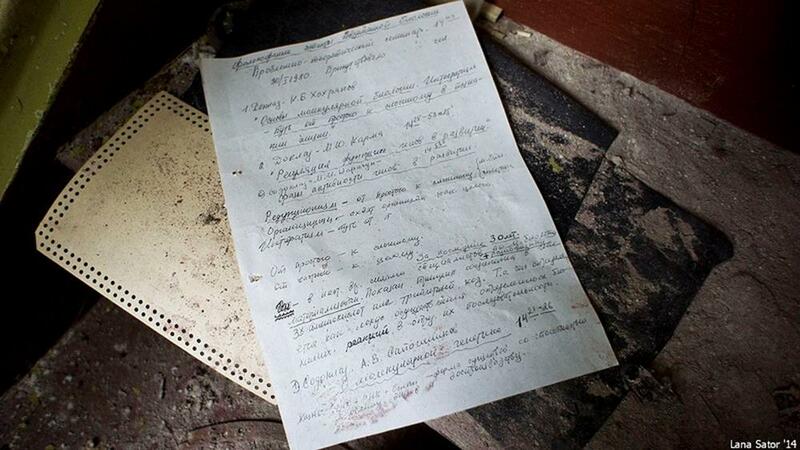 Notes taken by the staff of the institute. You cannot just leave without having taken a picture of the bathroom, and here it had been destroyed in quite an unexpected way. The walls are peeling, as it is usually the case with the buildings that have been abandoned for a long time. Then we climb to the attic using the small staircase. When the institute was still operational, the staff used all the available space as effectively as possible, so we discover some abandoned equipment there as well. We keep climbing up the narrow stairs. The building seems bigger on the inside than it does from the outside. On our way we see utility rooms with shelves, also a complete mess. Finally, we are on top of the tower. The structure does not look too good, but it is still quite solid, since the wood is much more resistant to the harsh local weather conditions than metal or concrete. It is rather cold and windy on top, so we quickly dive back inside. But not in all of them. We discover a pile of starfish skeletons in the library. And also the remains of a Soviet REM-100U electronic microscope. Some of the little cuties have come outside, probably wanting a hug. After taking a good look at the wildlife, we go down to the basement, where we discover a large number of reservoirs. 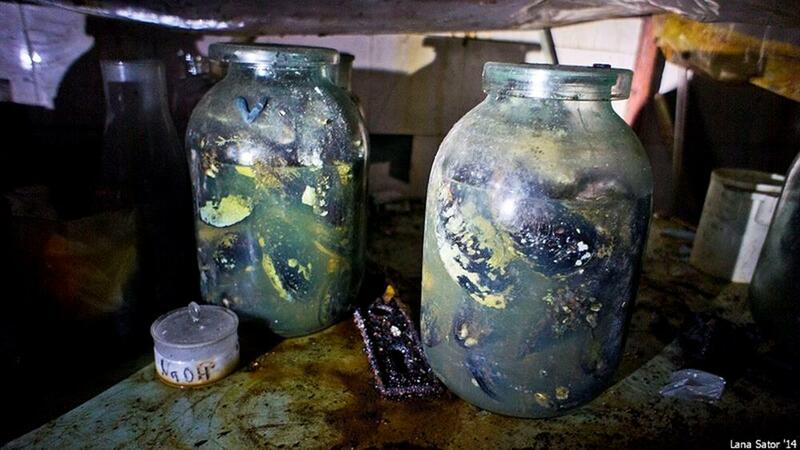 Maybe they were used for keeping fish and other live sea creatures for research. Everything the institute had collected from the sea during the long years of research is kept here. The photo lab, or, rather, what is left of it, also deserves some attention. Almost none of the equipment remains intact, but there is a whole storage full of film of various sizes and ISO. They could stock up a film photography lover for a few years. Although during the years of very doubtful storage conditions the film had probably changed its properties and could be now unfit for usage. Let’s leave the building and take a look at the adjacent grounds. There are small sheds scattered all around that were once used for storage and as small labs. Now let’s finish our long tour of this curious abandoned site located so far in the North and continue our journey.